Stephanie attended the University of New England in Portland, ME. She graduated in 2009 with her Associate of Science in Dental Hygiene and again in 2010 with her Bachelor Degree of Sciene in Dental Hygiene. While there, Steph was very active in the school community and served as President of UNE’s Student American Dental Hygiene Association chapter. She has been with us since March of 2010. 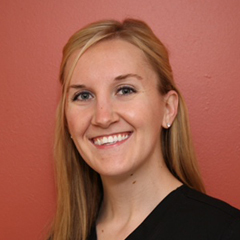 Her favorite part about being a dental hygienist is developing personal relationships with her patients. She loves working with each patient to make help improvements in their dental health, which is directly related to whole-body health. In her spare time, she enjoys traveling, being outdoors, and spending time with her friends and family. She is an avid New England Patriots fan and goes to games whenever she gets the chance!